Note: Learn about a new LGL Tributes feature that allows you to collect tribute gifts using an LGL form. This article presents two options for setting up a Little Green Light donation form so that donors have an option to designate their gift as a tribute (in-honor-of or in-memory-of) gift. The first is the easiest to set up and manage; it serves many nonprofits well. The second is more complex and requires more time to set up, map to LGL, and work through the final step of acknowledging the gifts. Both models shown below are intended for situations where you have one main donation form and your donors can either give a straight gift or make a tribute gift. Some nonprofits choose to keep standard gifts and tribute gifts separate and use one form for regular gifts and another form for tribute gifts. A form set up this way will be completed by the donor and the information will flow into LGL in relation to that donor only. No other constituent records besides the donor's will be added or updated. The information about who is being honored or memorialized will be stored as free text in the Gift Note field of the gift made through the form. First Name, Last Name, Email. Make all required. If you want mailing address and phone number, you can add those as well. Gift Amount field. Decide on whatever format you prefer. If you want recurring options, make sure that is appropriate in the context of possible tribute gifts. Multi-line input field. We suggest using the field name, "Please provide the name and contact information of the honoree"
Single-line input field. We suggest using the field name, "Please provide the name of the deceased"
Multi-line input field. 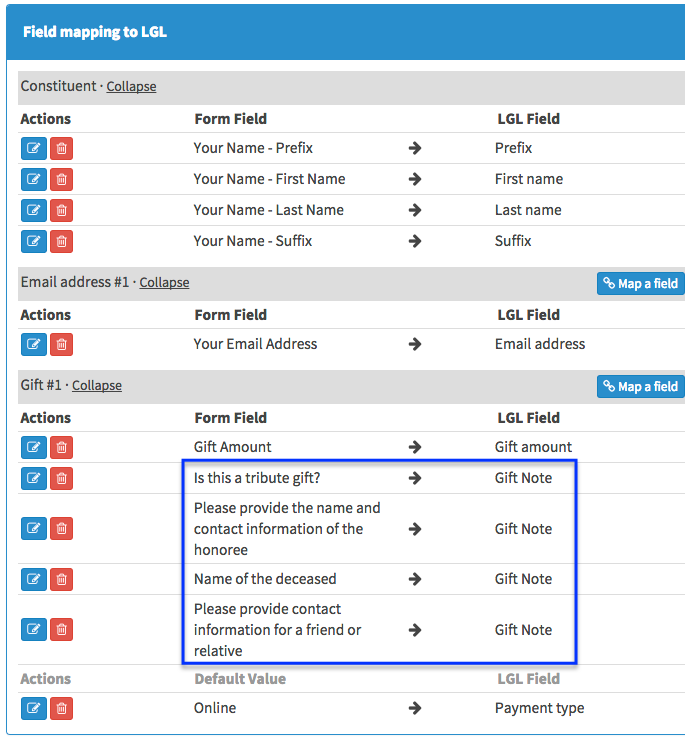 We suggest using the field name, "Please provide contact information for a relative or friend of the deceased"
Note: The above screenshot shows the fields in your form as they look when you view them in LGL Forms; it does not show what donors will see when they view your form live on your website. 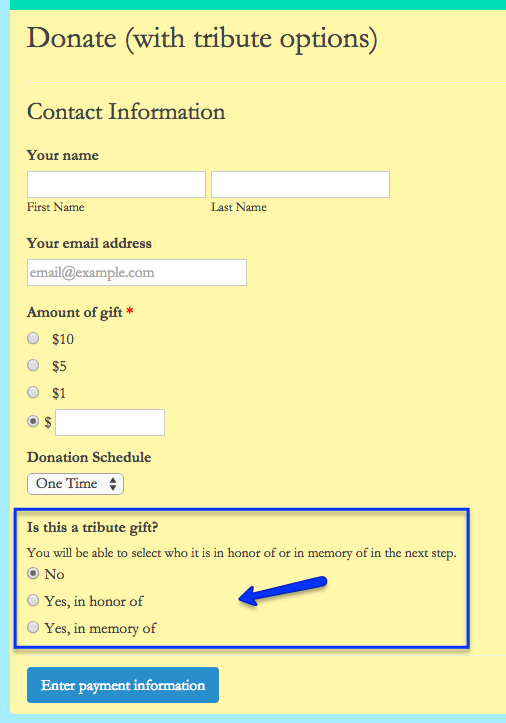 To make sure that a donor selecting "No" when answering the question, "Is this a tribute gift?" will not see any of the fields relating to honorary or memorial gifts, you will need to set up "display rules" for fields numbered 2 through 4 in the above screenshot. Below please find a short GIF video of the form in action. Note that the video loops. 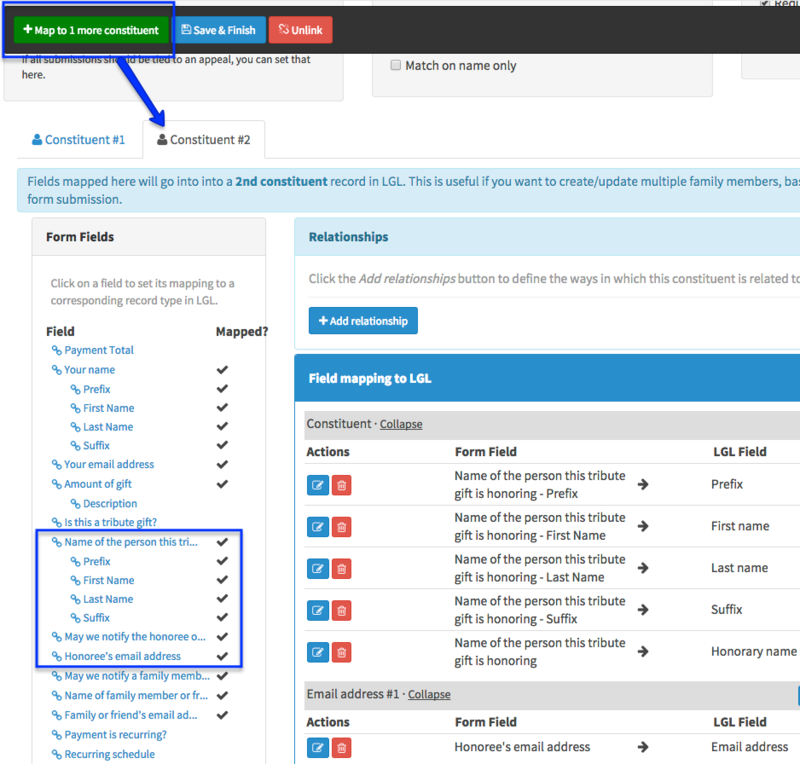 The screenshot below shows the mapping for the fields in the form, with all of the tribute fields being mapped to the Gift Note. 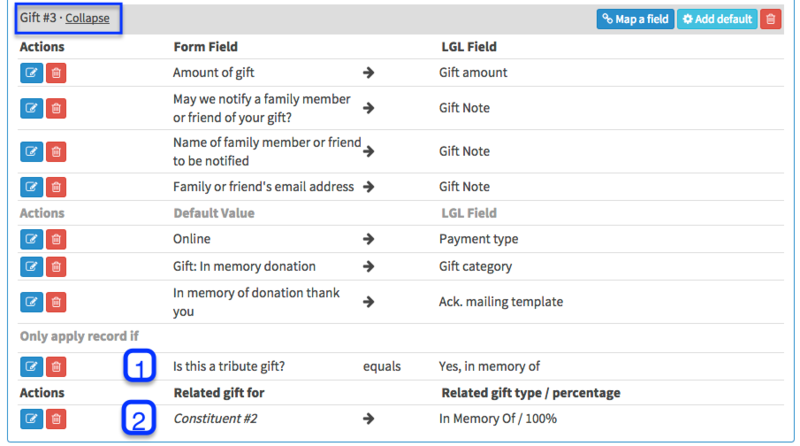 Note that this gift could have a gift category of "Donation", but you could also use custom gift categories to record it as an in-honor-of donation or an in-memory-of donation; that's what we've done in the example below. Acknowledgment: We will set it up so LGL connects the appropriate acknowledgment template to the gift, based on the whether it's a tribute gift or not. This related gift is assigned to the honoree or the deceased as a way of associating them with the gift but not as the actual donor (they are "related" to the gift). Note: If you do not want to create a constituent record for the honoree or deceased, you don't have to. Also note that there is no way to automatically set an acknowledgment letter for related gifts in the LGL Forms mapping, so that part would need to be done afterward directly in LGL. 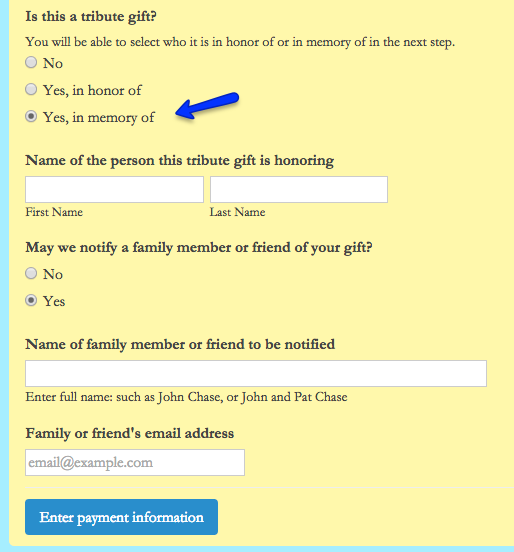 Here is an example of a donation form that includes the option to designate a tribute gift. 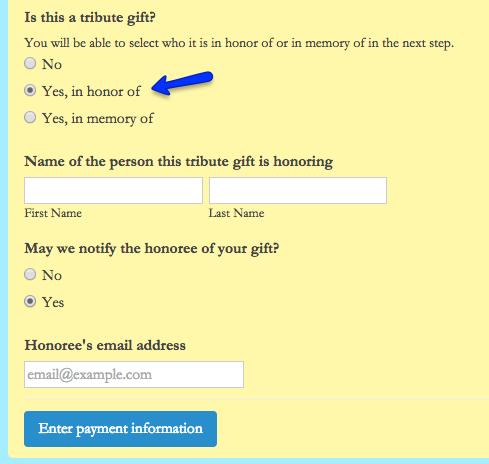 After clicking either of the two tribute options, the form expands to reveal additional fields. Next, click the Map to 1 more constituent button to create a place where you can map to Constituent #2. This is where the honoree (or deceased) person's contact information will go. Now you can go back to Constituent #1 and map their donation. In order to set up the donation in LGL as a regular donation versus an in-honor-of donation or an in-memory-of donation, and also so that we can assign the appropriate acknowledgment letter automatically, we will go through the gift mapping three times. Only one of the mappings will be used in any given form submission. When there is no tribute, use this Gift #1 mapping to map the gift amount, payment type, gift category, and the acknowledgment template. Then, click the Add rule button to make it so this entire gift record only occurs if there is no tribute associated with the gift. Our rule says to apply this record only if the value "No" appears in the form where we ask, "Is this a tribute gift?" See the number "1" in the screenshot below. After you save submissions into LGL, you'll see both the primary donation and the related gifts. These views are from the Fundraising tab search results.